Jellyfishee-fishee | Where Have You Been Lately? 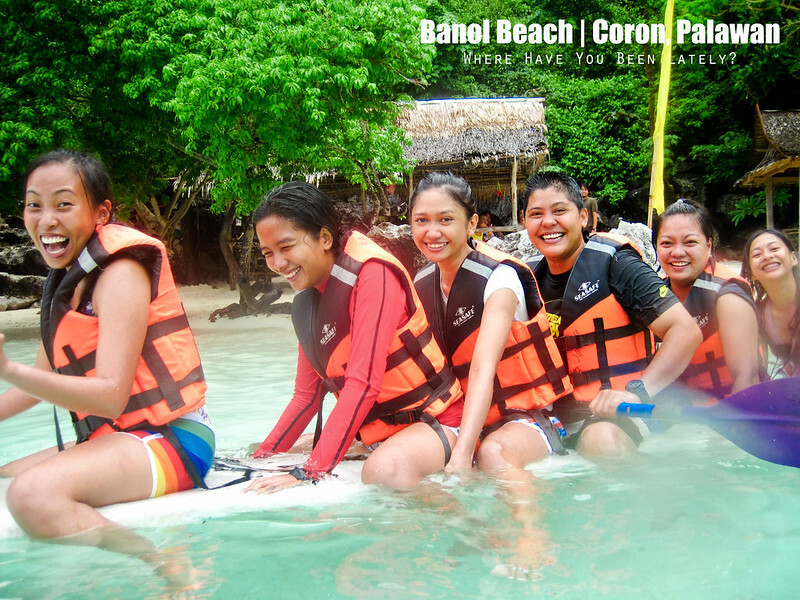 All the girls in our group were having fun as we rode a paddle board and pretended it was a banana boat. To make it more realistic, we wore life vests. Iggy was pulling the board into the deeper part of Banol Beach while Emma, who was seated in front, was rocking it back and forth. We were laughing as if there was no tomorrow; other visitors we don’t know were laughing too as we all fell off the board. Childlike and happy we were! Then we stopped. It was exhausting and we needed to rest. So Dudsy decided to take off the vest she had on. She rose from the water, went to the cottage near the shore where the boys were resting, dropped the vest, and then went back to the beach. It was just, what, three or four steps into the water when Dudsy started jumping like a maniac. We all thought that she just saw a group of fishes. Dudsy is afraid of the fishes. Ate Weng, our guide, immediately ran to part of the beach where Dudsy was and asked us not to go any nearer. She grabbed something by her hands and that was the time we figured Dudsy didn’t just see fishes. She got stung by a jellyfish. This is the exact jelly that attacked Dudsy. Ate Weng threw the culprit into the rocks, it was still alive but she could care less, she had to attend to Dudsy’s cries of pain. “Bi (her pet name for her husband), ang sakit-sakit! Sobrang sakit!“ She said, it seemed like her legs were electrocuted, pricked by thousands of needles. The second jellyfish our guide caught in Banol Beach. We, who remained in the water, were motionless. We couldn’t do anything but watch as Dudsy screamed out of agony. Fear also overcame us; fear that there were more jellyfishes in the area. Good thing Ate Weng knew what to do. From afar, we could see how she scrubbed Dudsy’s legs, yes both legs were stung, with the beach sand. Then she washed them with vinegar. Scrubbed with sand again, washed with vinegar again, scrubbed with sand then with rock salt, and then one final rinse of vinegar again. Though still crying, this somehow calmed the frenzied Dudsy. 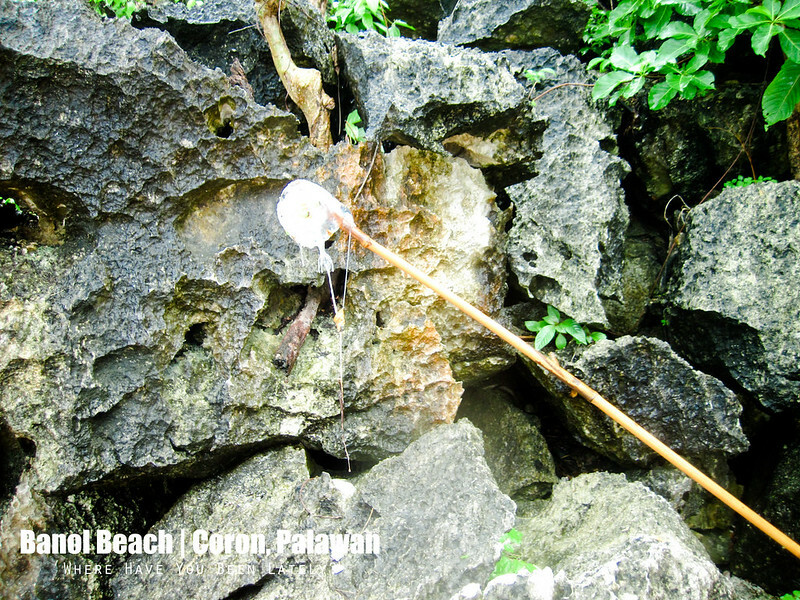 Ate Weng’s assistants dove into the water and found two more jellyfishes of the same type. Our guide who was supposed to survey the water first before letting us swim said, “Ma’am, tiwala po ako na safe kasi nakita niyo naman madami nang naliligo kanina.” True enough, there were already a few people swimming even before we arrived. 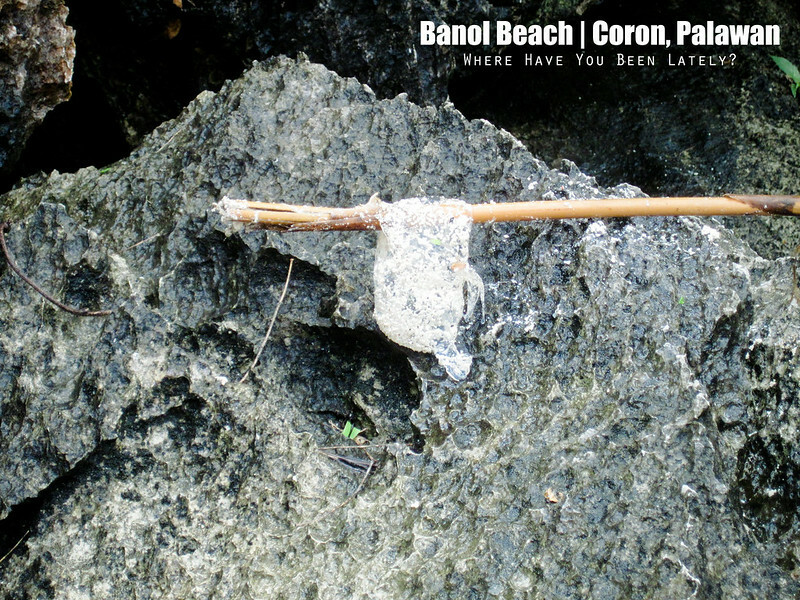 Bryan said there were a few more jellyfishes thrown into the other parts of the beach but the caretakers of the island mentioned nothing about it. Not even a warning. 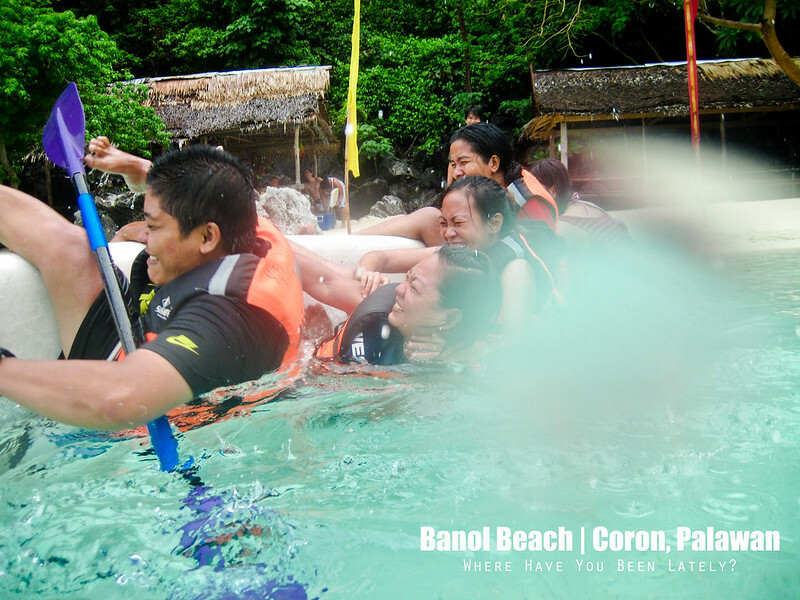 This incident almost ruined our entire stay in Coron. It was just the second day of our activities and yet fear already struck us. On our third day, we regretted paying the Php100 entrance fee in Malcapuya Island as it was literally flooded with thousands of jellyfish. Though, mostly are just as small as the fingernails, we just couldn’t brush off the scene we witnessed the other day. 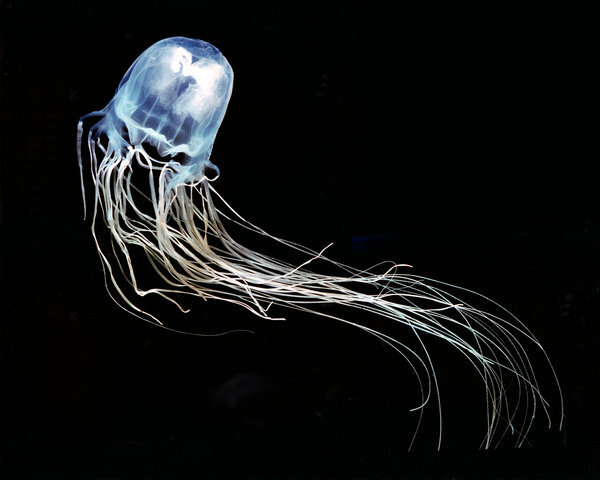 I don’t know if it’s a box jellyfish that stung Dudsy but it resembled this. Fortunately, the caretakers in Banana Island admitted that there are jellyfish sightings within the island and they really can’t do anything about it but warn all visitors to take extra care. There, we found three jellyfishes. Though dead, they were massive. 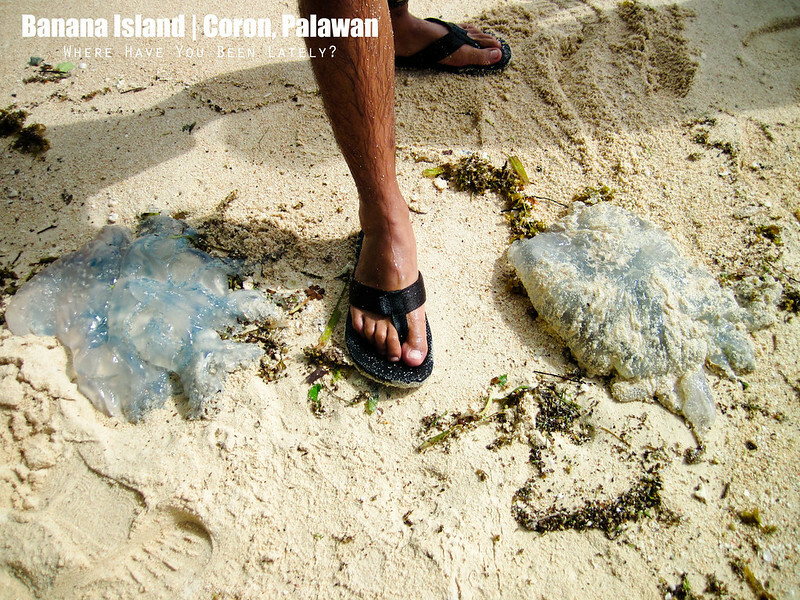 Just the thought of it made us go berserk when Bryan yelled jellyfish while we were busy snorkeling in the island. Apparently, these cute yet harmful and even deadly creatures tend to multiply and appear during the shifting of the season from summer to rainy. Will update this entry with more photos of the jellyfish that attacked Dudsy as well as the damage it did to her skin once I am able to borrow photos from ze friends. I remember my own bad experience being stung by a jellyfish also in Banol beach few years ago. It hurt and itched so bad for many days even though the creature that stung me looked like a wimp compared to the alien-like jellyfish in your pictures. I tried everything from vinegar to calamine lotion. But the only thing that really work was a few dabs of Tretinoin or more commercially known as Maxi Peel (yung pang tanggal ng pimples hehe!). It is apparently a good remedy for many types of itchy skin infection. Since then I’ve sworn my life to that product and made sure to bring some whenever I travel. ouch! i can imagine the pain. thanks for sharing the technique about the vinegar and rock salt. it’s great that somebody knows how to handle these situations. pero naiirita pa rin ako sa jellyfish after reading this post. hahaha. Thanks din to Drew for the tip about maxipeel! Sino me gusto sa jellyfish? Makakita lang ako sa dagat niyan, baka himatayin na ako. hahaha!